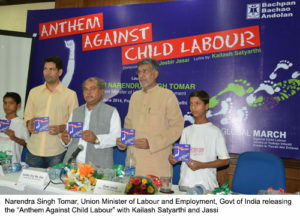 12 June 2014, New Delhi: In a first, the Union Minister of Labour and Employment, Narendra Singh Tomar commemorating the World Day Against Child Labour launched the Global March Against Child Labour report “Economics Behind Forced Labour Trafficking - Comprehensive Case Studies of Child Domestic Labour and Commercial Sexual Exploitation” and a music video “Anthem Against Child Labour”, at an event held at Press Club of India in New Delhi. “I dedicate my one month’s salary to Bachpan Bachao Andolan to carry out this noble cause to end child labour in India,” pledged Minister Tomar. “This government which has been elected with a clear mandate has already shown tremendous commitment to the elimination of poverty and this elimination of poverty is going to contribute to elimination of child labour. However, those exploiting these children must also be punished, and they must be punished with a legal deterrent. History has witnessed that former child labourers who have been rescued have gone on to do tremendous things for society. In India if we have to create a better future for our children, we have to protect all children. This government is totally committed for the total elimination of child labour from India, and it is going to do everything that is possible whether it is through making new laws or enforcing the existing laws, or changing the perceptions of the society,” committed Minister Tomar. The “Economics Behind Forced Labour Trafficking” report uncovers the garish realities of forced labour, focusing on trafficking of children for child domestic labour (CDL) and commercial sexual exploitation (CSE). Using a data-driven approach the report gives strong statistical evidence to highlight the extent and movement of money involved in CDL and CSE. The report is based on a sample consisting of 420 cases of child domestic labour and 196 cases of commercial sexual exploitation victims across India, Nepal and Bangladesh. A key point emerging from the report is that the costs of human trafficking on the economy are staggering. 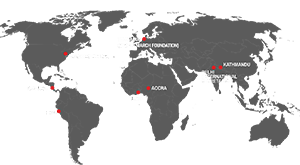 An unnoticed illegal monetary pool of anywhere between US$ 35 to US$ 360 billion is generated through the exploitation of victims of child domestic labour and commercial sexual exploitation in India accounting for approximately 2 to 20% of India's GDP. If a conservative estimate is taken, then as per the report, the amount of illegal money generated for just one victim of CSE in a brothel per year can range between INR 3 - 14 lakhs, amounting to US$ 30 - US$ 343 billion from brothels only in India.